Boston’s May, 1981, performances of Monteverdi’s opera The Coronation of Poppea marked a very special moment in the city’s musical history, for the production resulted from a major collaboration by three of Boston’s great musical institutions, all then still in their infancy – Banchetto Musicale (later to be known as Boston Baroque), Boston Lyric Opera, and the Boston Early Music Festival. Martin Pearlman had founded Banchetto Musicale, the first permanent Baroque orchestra in North America, during the 1973-1974 season. Its mission was that of presenting concerts of Baroque and early Classical music played in historical style on period instruments. Boston Lyric Opera had emerged in 1976 from the union of three smaller opera companies as an alternative to Sarah Caldwell’s Opera Company of Boston, with the goal of showcasing local singers. Under John Balme, who assumed the general directorship in 1980, the Company sought to present operas from all musical eras and styles. Still in an embryonic stage in 1981, the Boston Early Music Festival and Exhibition was the brainchild of Friedrich von Heune, the proprietor of a recorder and flute making workshop in Brookline. As president, Mr. von Heune envisioned the first Festival as a series of solo and ensemble concerts, exhibits and lectures, and a costumed gala, with Monteverdi’s operatic masterwork as the centerpiece. He hoped to spotlight Boston’s wealth of musical talent and its numerous resident groups already engaged in the authentic performance of music composed before 1800. Interested, as were the leaders of other young organizations, in expanding the musical life of the city, he turned to the two whose combined expertise could help him mount the production. 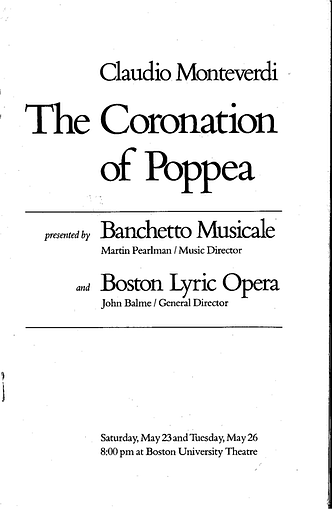 Boston Lyric Opera and Banchetto Musicale then joined forces to perform Coronation at the Boston University Theatre as the main attraction of the very first Boston Early Music Festival, presented over the course of the week of May 26-31, 1981. Banchetto Musicale and its musicians brought their established knowledge of period instruments and style to the work, along with Mr. Pearlman’s scholarly attention to translating it and adapting it for performance. Boston Lyric Opera contributed an experienced stage director, Jack Edelman, and its resident set designer, William Fregosi, as well as a group of talented singers, most of whom had performed with the Company previously, and many of whom also sang with local early music ensembles. This first Boston Early Music Festival succeeded admirably in cementing Boston’s reputation as the early music capital of the United States, as its organizers had hoped it would. The production of The Coronation of Poppea was deemed an important revival of a work considered by many scholars to be the pinnacle of Baroque operatic achievement, an auspicious beginning to the Festival’s stated mission of presenting lesser-known Baroque operas in a fashion as stylistically authentic as possible. Since that productive partnership the three collaborating organizations have seen their stars continue to rise in Boston. As an institution BEMF has grown and thrived and endures to the present, offering week-long festivals biennially in both Boston and New York, and presenting a wide range of concerts of Medieval, Renaissance, and Baroque music throughout the year. The June 2017 Festival is currently ongoing, and features two festival operas, 18 concerts, and the world-famous exhibition – learn more. Banchetto Musicale, performing as Boston Baroque since 1992, has become an internationally recognized period instrument orchestra, often recorded, three times nominated for Grammy awards, performing regularly in Boston and on tour. Boston Lyric Opera has just completed its successful 40th Anniversary Season, and is recognized nationally and internationally for its daring artistic choices. It is deeply committed to the commissioning and production of new works, all while offering a balanced range of repertory each season. Striving to maintain its unique Boston identity by engaging local artists through its Emerging Artists effort and by producing multiple community engagement activities, it too has become an essential element in the artistic life of the city. Boston can be most proud of the three young institutions that worked together all those years ago, nurturing each other’s growth, urging each other along the road to the fulfilling maturity that each of them has achieved. Images (top to bottom): The program cover for The Coronation of Poppea, presented by Banchetto Musicale and Boston Lyric Opera, May, 1981. 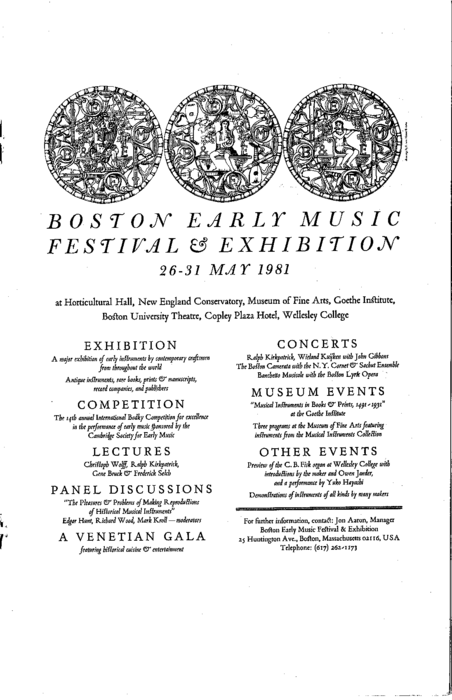 The program book ad for the first Boston Early Music Festival, May 26–31, 1981. 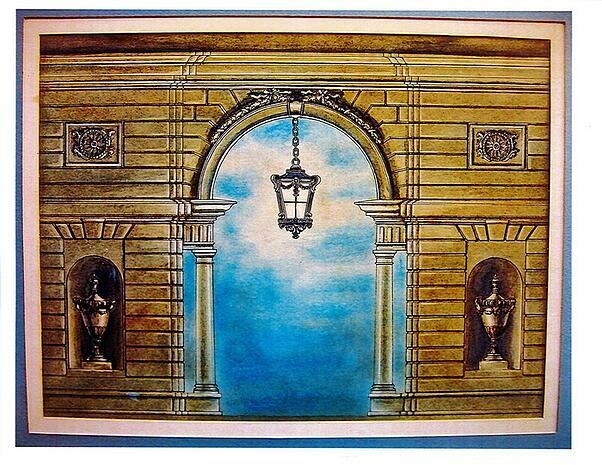 A set design rendering for Poppea by designer William Fregosi, reproduced with permission. Note 1: I am indebted to William Fregosi, Boston Lyric Opera’s first resident scenic designer, for apprising me of the collaboration of these three organizations on this project and inspiring further research. Note 2: Demonstrating the continuity of the musical life of the city, we recognize the fact that baritone James Maddalena, who sang Mercury in the 1981 Coronation of Poppea, has been cast as the Sacristan in Boston Lyric Opera’s production of Tosca (October, 2017) and as Mr. Peachum in its production of Weill and Brecht’s The Threepenny Opera, (March, 2018). Mr. Maddalena has built an important career in opera and has performed with BLO on numerous occasions throughout.